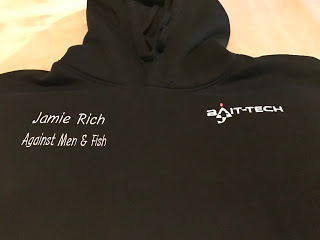 Now that the blog is associated with Bait-Tech I thought it was high time I treated myself to a new hoodie. 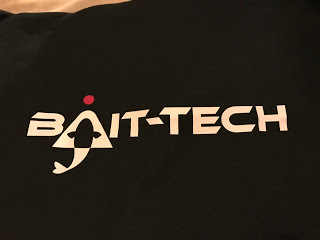 In the past I’ve always used a local shop to get the blogs name embroidered on hoodies, sweatshirts and polo shirts etc but as Bait-Tech have a shop on The PrintBiz website (www.theprintbiz.com), I thought I’d take a look. 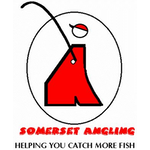 Once on the site it was just a case of going to categories and clicking on the Bait-Tech logo. 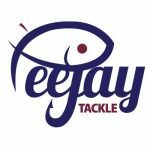 There’s a great selection of merchandise, everything from t-shirts and joggers to caps and mugs all with the Bait-Tech brand emblazoned on them and with most of the clothing you have the option to have your name or club or in my case, blog’s name, embroidered (up to 50 characters) free of charge. The hoodies certainly looked the business and are described as a ‘High quality heavyweight hoodie’ with ‘Embroidery to FLB and right arm and print to rear’ and were very reasonably priced at £26. 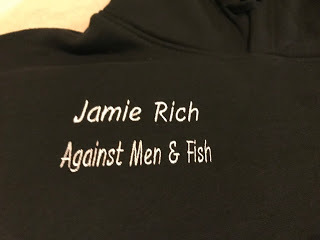 Now I know this is a very minor issue and overall I am very, very pleased with this product and the service but it will niggle me as the blog is called Against Men and Fish. 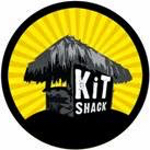 I still fully intend to order some more polo and t-shirts but I will give them a ring before I order just to make sure it’s right next time.